Construction has commenced at Ellesmere Street, Castlefield, where Manchester based CW Studio has designed the public realm and private courtyard associated with this 1.25 acre residential development. 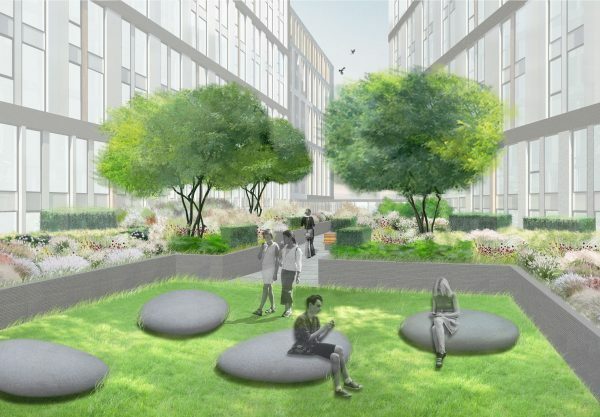 A stepped granite terrace with funky metallic planters and stone seating steps provides an attractive new public open space and a welcoming entrance to the development, while visually attractive planting will provide year round interest. The private contemporary courtyard garden will provide a relaxing space for residents. Raised planters allow a variety of plants and multi-stem trees to be grown on the roof, while oversized pebbles create sculptural seating on the lawn. Planting includes clipped yew hedging, ornamental grasses, perennials, ferns and spring bulbs. CW Studio has designed the landscape, working in collaboration with Glenbrook Property, AEW Architects, Shepherd Gilmour and Graham Construction. The scheme will offer over 200,000 sq ft of high quality living accommodation across 3 blocks ranging from eight to twelve stories. The scheme has been specifically designed for the Private Rental Sector. Residents will benefit from a range of facilities including concierge facilities, a residents gym, secure cycle storage and basement car parking. Construction is due to complete in 2018.